In addition to our existing Aura tables, we are adding the 300cm rectangular dining table, plus two ‘narrow-width’ 140cm (has been selected for the ICFA Design Excellence winner in the Dining/Bar Table category), and 200cm rectangular high dining tables. 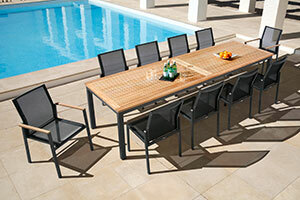 With a powder-coated frame and stylish teak top, perfect for entertaining 6-8-10 guests. To this collection we are incorporating the Aura side chair, with its sleek lines and hard-wearing Textilene seat, a perfect addition, ideal to combine with our Aura dining tables.